Inside you will find parts to assemble 40 plastic Arab warriors. 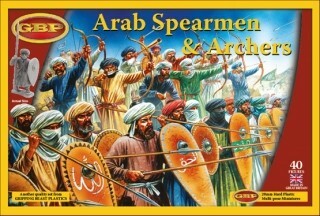 You can make a combination of up to 16 archers, 16 javelin men or 40 speamen. The box also contains extra parts to build some of your figures as horn blowers or swordsmen. Box also contains Renedra plastic bases for all your figures.